I know it's a little early to be talking about Christmas or any of the other upcoming winter holidays, but I think you'll forgive me for doing so once you lay your eyes on the Christmas-y thing about which I want to talk. 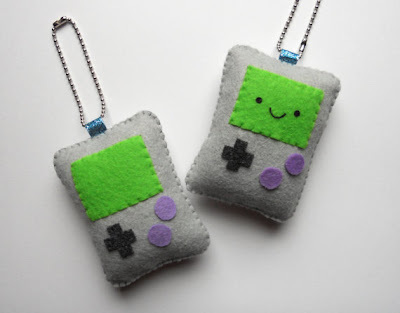 Showcased in the photo below is a GameBoy ornament (or keychain, if you prefer) that's currently being sold by Canadian fiber artist Michelle Coffee via her etsy shop. A single 2.5-inch-by-3.25-inch ornament will set you back just over $12 (not including shipping, it seems)--which really isn't too much when you consider the, er, adorableness it'll add to your tree or wreath this holiday season. These are adorable! I wish my stitching was that neat, I'd never stop making little things like that! Wish I could buy them in bulk and decorate my tree with a gaming theme! Oh, that would be cute, I think! Would you use game sprites as a guide, or just make them freeform?